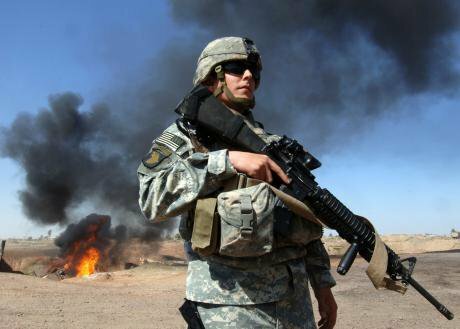 A member of the US armed forces by an Iraqi oilfield. Wikimedia commons.Kobane was supposed to fall. As ISIS assaulted the town, Turkish troops besieged it from the north, preventing reinforcements and arresting hundreds fleeing. US jets bombed ISIS forces elsewhere, driving them towards Rojava: the largely Kurdish region in northern Syria self-administered by the movement for a democratic society (Tev-Dem), headed politically by the PYD, and defended by the YPG and YPJ. A month into the battle, Kerry admitted that defending Kobane was still not a US strategic priority, despite growing pressure for an airdrop. Why was the US happy to see ISIS crush Rojava? The heavy violence in Syria is heavily influenced by oil-driven geopolitics. This goes well beyond the smuggling of crudely refined fuel from ISIS-controlled Deir Ezzor into Turkey. For decades, energy colonialism has enabled the repression of democratic movements. Large oil fields and potential export routes contributed to Kurdistan - spread between Iraq, Iran, Turkey and Syria - being subjected to intense violence. For over a century, foreign policy decisions made in Washington, London and Paris aimed to control oil reserves in the region and preserve corporate profits. Borders were drawn, autocrats were supported and weapons poured in. Kurdish movements were used opportunistically and encouraged to revolt - only to be abandoned and slaughtered once short-term goals were achieved. The 2003 war on Iraq and 1990s sanctions followed a much older pattern: where democratic forces and organised labour grew, British and US governments, corporations and local elites crushed them. When oil workers in Iraq occupied a pipeline pumping station in 1948, the company surrounded them with machine guns and armoured cars, starving them out. The next year, the Syrian parliament refused to ratify construction of the Trans-Arabian pipeline. The oil companies had the CIA organise a coup and the new military government immediately completed the agreement. Today’s pipeline routes are the product of wars and political struggles, expensive infrastructure, mass displacement, and intensive corporate lobbying. Kurdish communities were seen as a threat, and subjected to cultural assimilation, forced emigration and brutal crackdowns. The enormous twin Kirkuk-Ceyhan pipelines from Iraq to the Mediterranean snakes its way through the Kurdish mountains, carrying 1.6 million barrels of oil every day. Its construction brought thousands of Turkish troops along its the route and into nearby villages. Oil reserves in both Syria and Turkey - while not enormous - are heavily concentrated in Kurdish areas. 60% of Syrian oil is in and around Rojava, while 99% of crude extracted in Turkey comes from the south-east. Shell recently started fracking for shale gas around Diyarbakir. More reasons why Turkish and Syrian governments opposed any Kurdish autonomy. The conservative-nationalist Kurdish Regional Government in Iraq managed to leverage its oil resources to attain significant autonomy, largely by making itself an ally to western energy interests and neoliberal power. 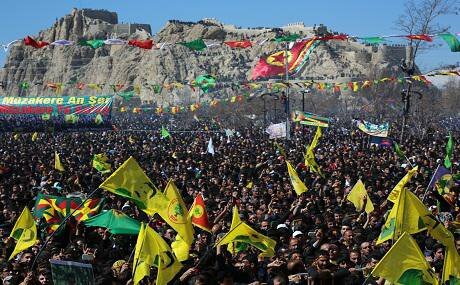 In contrast, the Kurdish movements in Turkey and Syria are aiming for greater social liberation. Rojava’s deliberative politics has created a vision of an ecological society not subjugated to neoliberalism. Its political economy is characterised by community-based production and large-scale cooperatives. The Assad regime's property was turned over to worker-managed co-operatives. A free Rojava is less open to exploitation for foreign interests, like Gulfsands, the London sanctions-dodging oil company that drilled for crude in Rojava. The PKK and PYD are the most organised and democratic political forces in the region, and have the best chance to begin democratising and decolonising energy. Energy democracy in the Middle East would be transformative globally. Western elites use the control of oil overseas to weaken democratic forces at home, fearmongering about “energy security” and undermining the power of energy workers. This is one more reason why the US and Turkey are relaxed about ISIS and the YPG battling it out. No elite power wants a progressive and democratic revolution that could begin to transform our energy future. Neither the US or Russia, Turkey or Iran, the Israelis or Saudi Arabia. By delaying meaningful airstrikes on ISIS positions around Kobane, the US ensured that the PYD became dependent on western support. The YPG needs heavy weapons - airdrops have begun and there is potential for more. The US excels at using “aid” to alter movement politics and enforce subservience. Guns come with strings attached and American military advisers to pull them. But the PYD/PKK have deep ideological roots and hopefully won’t roll over. Whichever way the battle for Kobane ends, the longer struggle for Rojava will continue. We all need Rojava, as an inspirational model to draw on, and as an ally in dismantling energy colonialism that keeps us all weak. Rojava needs us, and we need Rojava.